Autumn in Inverness and the Highlands is AMAZING. Inverness always has a lot to offer whether you are looking for a romantic escape in the gorgeous Autumn colour or an action packed family adventure to fill the October school break. 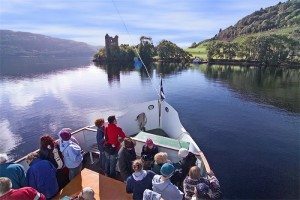 Read on for your Wow Days Out On Loch Ness! Discover Inverness this Autumn, book your Early Bird Autumn Escape Offer and stay at the Inverness Palace Hotel & Spa. Take advantage of half price room upgrade & treat yourself to a half price luxury River & Castle View room! We always want you to make the most of your time in Inverness and the Highlands see below for some ideas. 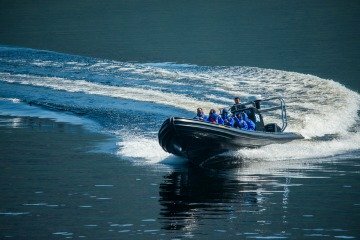 Whether you are on your own, with your partner, escaping as a family or perhaps a luxury weekend escape with the girls make sure you make time to experience the BEASTIE BOAT, on Loch Ness, one of our top ideas for wow days out on Loch Ness. The Beastie Boat is a fabulous new addition to a day out in Inverness. The Beastie Boats are brought to you by the much loved and trusted Jacobite Cruises!! Your fabulous adventure begins on the shores of Loch Ness at the Clansman Hotel. Park your car at the hotel, it it’s full you will be directed a few 100 meters further along to a private car park. Just plan to be in slightly further away and you wont be late, it’s only an extra 5 minute walk. Don’t worry, you will cross the A82 via the underground walkway. When you arrive at the dock you will see a storage building, in front you will see your carriage, a large serious looking RIB perfect for an hour of thrills on Loch Ness. Robbie will be your host and captain for your exhilarating adventure on Loch Ness. Just walk over and say Hi, he is very welcoming and you will get to meet your fellow adventurers. You can leave your valuables safely locked up in the Beastie Building, as you will not want to take them on board. Get all togged up in your bright Blue Dry Suits, life vests, don’t be shy take the glasses Robbie offers you will need them! Ears pinned back he will deliver the safety briefing. 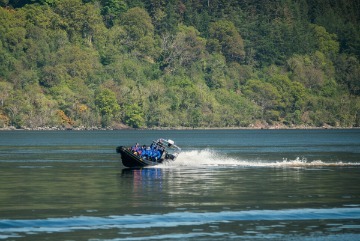 The Beastie Boat is new to Loch Ness and many visitors aren’t aware of the option of speeding your way down the vast Loch Ness, taking in some truly special historical sights but at a much more exciting pace. These folks have signed up for the still fabulous but more sedate Cruise and Land tour options. We noticed that many groups were looking on with envious eyes as our RIB stirred into life with a gentle roar of its powerful engines matched with appropriate tunes for you to toes to tap to! Where to Sit on a Beastie Boat? Choosing your seat on board, the dilemma of where to sit can prompt the occasionally snarl even amongst friends. Well I can simply say there is no wrong seat on the RIB! Each one of us had a great view and when we paused to catch our breath you could swivel round and take in the great views. There are 2 seats that may get slightly wetter than the rest, a little surprise!!! Plus two saddle styles seats at the front of the RIB, best shared by friends or family members unless you are want to make a new friend!! As you gracefully exit the dock prepare yourself to hold on tight and fly across the tops of the waves on Loch Ness!! WE flew across the Loch, a few small yelps, screams of excitement and delight as you bounce whizz towards Urquhart Castle! A little more on Urquhart Castle later in the blog. My 15 year old son loved the sheer power of the RIB and explained that “we were doing the equivalent of a donut on the water”. Robbie filled us in on the history of the castle and made sure we got a fantastic view from the water. Tunes on, engines roared and we were off again! I don’t want to give away all of your trips adventures safe to say it is an exhilarating adventure, one that the whole family would enjoy even those hard to please teenagers. We had a mini dare devil on our boat he was 6 years old and he and his dad sat at the very front on the saddle seats and he loved every minute of his Loch Ness adventure! You will want to go back on the Beastie Boat, you will tell your friends, although you may not have too many pictures, it will be one of the highlights of your trip! Urquhart Castle is magnificently situated on the banks of Loch Ness, it still resembles an impressive stronghold. Urquhart Castle was one of Scotland’s largest castles. Whilst a significant portion of the Castle was destroyed it still has huge presence. 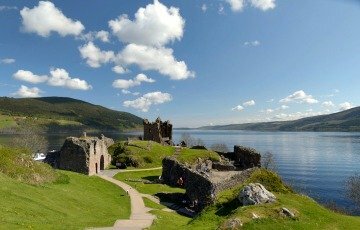 Make time to climb the steps up the Castle Tower and be rewarded with stunning views of Loch Ness. The castle has witnessed considerable conflict throughout its 500 years, its history from the 1200s to the 1600s was particularly bloody. In the new visitor center there is a new informative audio visual display which tells you all about the castle’s history. There are plenty of places to take in the view, the castle is surrounded by a sloping grass field. The field runs to the edge of the Loch and is a great place to take in the view of the Castle and Loch Ness. If the exhilaration of the Beastie Boat isn’t for you, then I would recommend a Jacobite cruise. 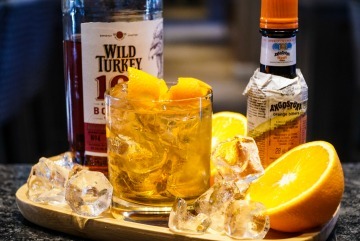 You can take in the sights from the warmth of a cabin, appreciate the more sedate pace, and even a wee dram or maybe even just a bathroom then they are sure to have a cruise to suit your needs long or short they will have an option for you to enjoy. 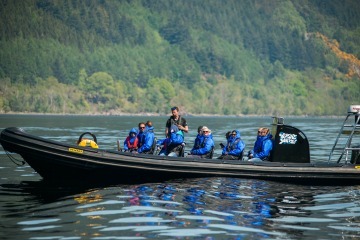 Taking in Loch Ness from the water is a very memorable experience, it provides a while new aspect to Loch Ness. A Top Tip would be combine both of these activities, stop at Urqhuart Castle then you will appreciate it‘s history and can then see its majesty from the water on your Beastie Boat or Jacobite cruise! A trip to Loch Ness wouldn’t be complete with some Nessie spotting! Nessie is one of the biggest myths or legends in our folklore or is it? Get ready for an adventure, your chance to do some Nessie spotting first hand. Get started with Visit Lochness then there is the Loch Ness Exhibition to find the magic in the water. Make sure your wow days out on Loch Ness include a stay at the Inverness Palace Hotel & Spa. 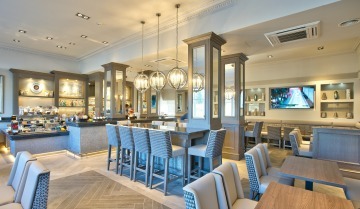 You can look forward to a warm welcome, we are ideally located on the banks of the River Ness, opposite the castle. It is only a few minutes walk to the Inverness Castle viewing platform, the lovely Ness Islands and the city center. Make Your Escape to the Highlands this Autumn with your Early Bird Autumn Escape Offer! Book your Early Bird Autumn Escape Offer from only £84.95 per person per night in September to £ 64.95 in October, £49.45 in November and only £44.45 per person per night in December. Includes Red and White waiting in your room for your arrival, a delicious Scottish buffet breakfast. 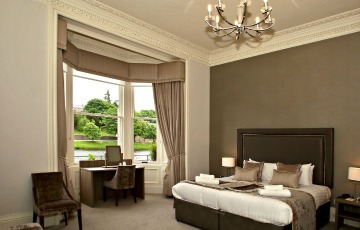 Plus you can upgradey our stay to a luxury Castle and River view room only £25 per room per night. Don’t forget we offer parking, free wifi to our guests and freeaccess to the luxury Leisure Club & Pool. Remember#bookdirect for your best offers. Call our reservations team on 01463 22 32 43 or email us at Palace. We look forward to welcoming you soon. PS Don’t Miss the New your chance to enter our Autumn Escape Competition and if you are the lucky winner you will WIN a luxury Autumn escape complete with a stay in a luxury River View Room!